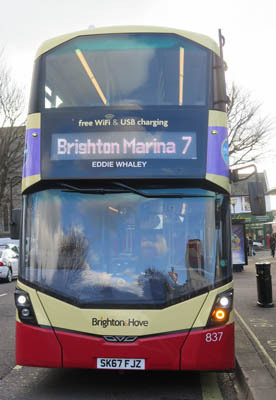 Connections with Brighton and Hove : Eddie Whaley and his partner Harry Scott were African-American music hall and radio comedians who came to England in 1909 and settled there. They were the first black performers to star in a British film, Kentucky Minstrels (John Baxter, 1934). In the film, they recreated the roles they had popularised in their long running BBC radio series. Eddie Whaley moved to Brighton in the late 1930s and bought 124 Marine Parade next door to a house owned by the comedian Max Miller. In the 1950s the house was named in large black letters WHALEY HOUSE. Eddie Whaley lived there until his death in 1960. He was cremated at Woodvale Crematorium. Eddie Whaley had a son born in Brighton in 1939 who became a performer in his own right. He appeared on stage with his father as Little Whaley. Eddie Whaley Jr. had a good role in the classic film Black Narcissus (1947) at the age of seven. In 1959 Eddie Whaley Jr. left Brighton for the USA and within a month was inducted into the US army. After three years of military service he took up a showbiz career and worked with some of the greats including Tommy Trinder, Tommy Cooper, Max Wall, Dave King and Yana. He joined the Deep River Boys where he remained for three years. He now lives with his family in Florida and occasionally visits Brighton. 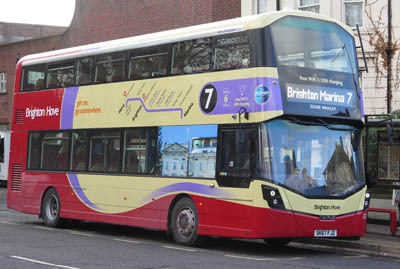 837 Mercedes Streetdeck on Route 7 - carried name since November 2017.